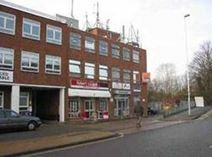 Office Space - Ruislip, London Borough of Hillingdon. This property is located in Eastcote, Middlesex, an area which benefits from being close to London while escaping the costs associated with renting space in the capital itself. Transport links into London are great with the Metropolitan Line station just opposite and good road links via the M40. The offices themselves provide front and rear access, a passenger lift and a service that includes cleaning, maintenance and security.